Are you searching for the best closet shelf divider which will keep your towels, linen, sweaters, t-shirts, purses and handbags well organized, neatly separated into piles? Well, you found them already - Our value pack of 2 closet shelf dividers! BEST PRICE IN THE MARKET - Offers higher value than other brands, manufactured with better quality in mind and significantly priced lower. If this isn't a steal then tell me what it is! DURABLE - Sturdy and built to last with 4mm heavy duty acrylic . STYLISH - Gives your base kitchen cabinet or closet a classy, stylish, well-organized look. 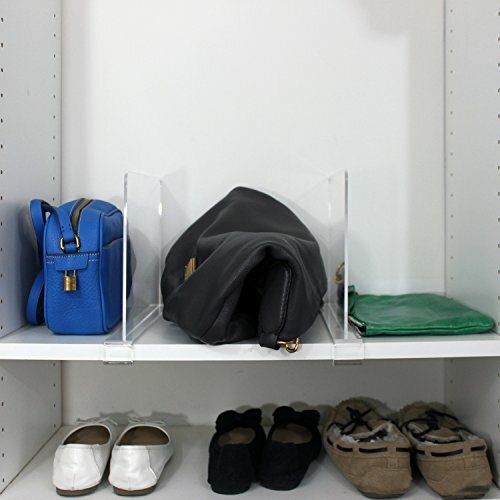 PERFECT SIZE - Our shelf dividers stacks higher and neater than other closet separators in the market! MULTIFUNCTIONAL: It can be used as a shelf separator for closets, kitchen pantry, library, boutique, etc. ALL OCCASION GIFT SET - Suitable gift for baby showers, wedding ceremonies, and mother's day. Our customers are our number one priority, so we do not compromise on the quality of our Acrylic Shelf Dividers Organizers! Since, we understand that mistake happens all the time, if for any reason you are not satisfied with the clear shelf dividers, please contact us directly and we shall replace it or refund you. EXPERIENCE THE BEST WITH US BY CLICKING THE YELLOW ADD TO CART BUTTON NOW! AN END TO CLOSET CLUTTER - Quit searching for your T-shirts, towels, purses, sweaters, linens or handbags every time! Our value pack of two crystal clear acrylic shelf dividers will help you organize your closet, creating extra space while making sure that every item is easily accessible! PERFECT FITTING WITH GOOD GRIP - Our acrylic shelf dividers require no assembly! It simply slides easily onto ALL 1/2" to 3/4" thick Standard Sized Shelves (at least 12" deep) via the innovative slide design which keeps it firm and securely in place. Good grip ensures they stand up straight without wobbling once installed! Each divider is 8" high, 12" long, and fits on shelves 1/2" to 3/4" thick. Please note that the divider will not work with upper kitchen cabinets that are less than 12" deep. THE SECRET BEHIND A WELL ORGANIZED CLOSET - Since Acrylic is stronger, clearer, lighter and safer than glass, wood or chrome closet dividers, it makes sense to purchase our acrylic shelf dividers which make your closet neat, separated and well-organized. Your face will light up with "smiles" each time you open your closet and find everything in neat piles! BUILT TO LAST - Unlike the shelf dividers offered by the competition which break easily, our high-performance acrylic shelf organizers are sturdy and guaranteed to last a lifetime! Please make sure your shelf is 1/2" to 3/4" thick. VERIFY SHELF SIZE - Our shelf dividers fit on 1/2" to 3/4" thick Standard Sized Shelves. If you have any questions about this product by Clearly Organized, contact us by completing and submitting the form below. If you are looking for a specif part number, please include it with your message.